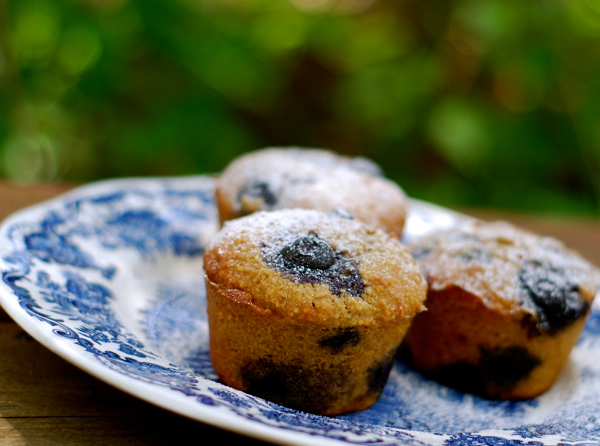 This is one of my favorite recipes for muffins. They’re insanely moist, wonderfully sweet, grain free, and perfect with my morning cup of tea. If you don’t like the addition of lemon zest, just omit it, but I think it brightens the flavor of the blueberries. I sometimes make a thin glaze for these using coconut sugar or honey mixed with the juice of a small lemon, but they really need no embellishment. Grease 6 standard size muffin tin cups with coconut oil, or use a Demarle/Silpat muffin pan which needs no preparation. In a large bowl, combine the flour, baking powder and salt. In a separate bowl, combine the eggs, butter, sugar, vanilla, almond milk and lemon zest. Add the wet ingredients to the dry ingredients and mix until everything is evenly combined and moist. Gently fold in the blueberries. Evenly fill the muffin tins. Top off with a few more blueberries. Bake for 20 to 25 minutes, or until golden brown and a toothpick comes clean when inserted into the center of a muffin. Cool in pan for 10-15 minutes before transferring to a rack to cool completely.